Any of various venomous snakes of the subfamily Crotalinae, such as the copperhead, rattlesnake, or fer-de-lance, characterized by a small sensory pit below each eye. any one of a family of venomous snakes found in the Western Hemisphere and Asia, characterized by a heat-sensitive pit between the eye and nostril on each side of the head and hollow perforated fangs that are usually folded back in the roof of the mouth. With the exception of coral snakes, all indigenous poisonous snakes in the United States are pit vipers. See also copperhead, cottonmouth, rattlesnake. 1. a hollow fovea or indentation. 3. to indent, or to become and remain for a few minutes indented, by pressure. 4. seed of a fruit, e.g. cherry. Strictly refers to the hard woody coating which surrounds the seed. the proctodeum of the embryo. a distinct depression in each auditory placode, marking the beginning of the embryonic development of the internal ear. a term used in describing various types of dogs used in past times for fighting in pits. Now, usually refers to the specific breed, american pit bull terrier. a pitlike depression in the fetal head where the lens develops. a depression appearing in the olfactory placodes in the early stages of development of the nose. Called also olfactory pit. early stage in the development of the embryonic inner ear. pony used in a mine to haul mined rock. Breed varies as long as it is small, e.g. Shetland pony. the epigastric fossa or epigastric region. Thrombocytopenia and coagulation abnormalities are common with pit viper envenomation, and echinocytosis is commonly seen on blood film examination. 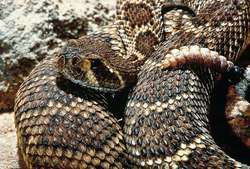 He submitted that the poison used in the July 2010 "Lily Robinson and Ready, On the Set, Go" came from the Deinagkistrodon acutus, a Southeast Asian pit viper. Arboreal green pit vipers (genus Trimeresurus) of South-East Asia/; bites by T.
A one-eyed male was observed foot-flagging and toe-wiggling at a tail-luring pit viper (Bothrops jararacussu), then approaching it. For example, pit vipers possess incredible heat-detecting capabilities that are much more sensitive than anything we can do without the need for cryogenic cooling. I've gotten poison ivy, oak, and sumac off of the animals' coats and inhaled these poisons while burning brush piles (that were full of pit vipers and a skunk or two). In medicine, the venom of a South American pit viper led to the discovery of the system that regulates blood pressure in human beings. A pit viper has two heat sensors, called pits, on the front of its face. Greene and other scientists estimate that of the world's roughly 145 pit viper species - including 17 in the United States - at least 80 are threatened with extinction. Dole himself seems to have the moral compass of a pit viper. The drug Ancrod was derived from the venom of a Malaysian pit viper.